There are plenty of reasons to go with granite countertops if you are updating your kitchen. It is a natural stone that is both heat and scratch resistant. To make it even more durable sealing the material will also prevent staining while helping to keep the surface bacteria free along with regular cleanings. Granite also comes in lots of beautiful colors and patterns―some options even resemble marble, which typically costs more per square foot. Whether your style is traditional or modern, there is a granite countertop out there that will suit your cooking space. To get inspired here are our 21 favorites. Gorgeous greenish gray countertops in a specific style called Costa Esmeralda granite lends a luxurious touch to this traditional kitchen by Crisp Architects out of Millbrook, New York. Just like white cabinetry, granite countertops have enduring style. Case in point, this traditional cooking space by Robeson Design out of San Diego, California. The countertops are Blizzard granite. The slabs feature a creamy white background with prominent gray veins. White Princess granite is a natural stone material that resembles marble for a fraction of the price. Feast your eyes on this drool-worthy example by Lisa Gabrielson Interior Design situated in Johns Creek, Georgia. Other features worth mentioning include the herringbone style backsplash in glossy tile over the range and the iron pendant light fixture over the kitchen island. Nothing modernizes a kitchen like two-tone features such as cabinetry, and of course countertops. This modern farmhouse kitchen by Maryland based, Case Design pairs a butcher block topped island with a gray granite countertop. Beautiful black granite with beautiful white veins makes a stunning statement in this modern shaker style kitchen. The cooking space was designed by Hatfield Builders and Remodelers situated in Dallas, Texas. This highly polished countertop is Black Pearl granite. The glossy surface pops against the matte white cabinets. Construction Resources out of Atlanta, Georgia designed the cooking space. In this rustic inspired cooking space, Michigan based, Gomez Granite, paired dark wood cabinets with a lovely Luna Pearl granite countertop. The material is also known as Bianco Sardo granite. The slab features an intricate pattern of soothing grays and soft whites. 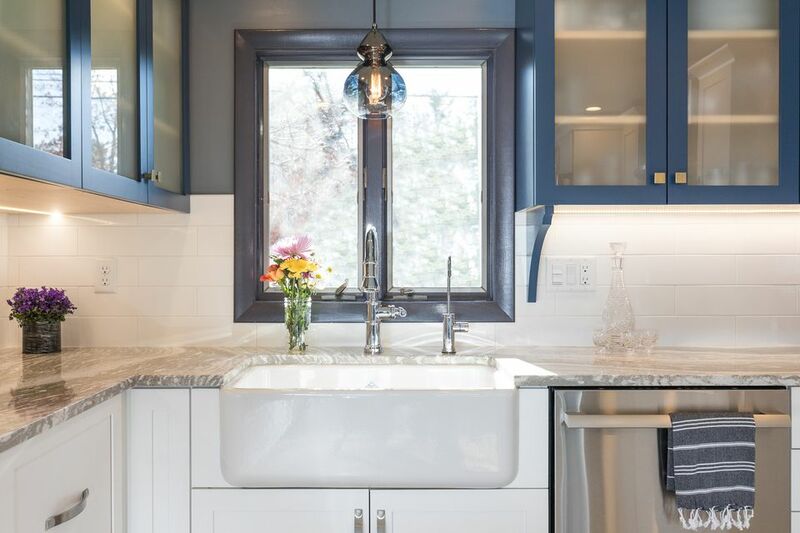 This stylish blue and white, modern kitchen is by New England Design Elements situated in Londonderry, New Hampshire. The cooking space is tricked out with gray granite countertops. The stone's natural color coordinates beautifully with the stainless steel appliances and two-tone cabinetry. Speckled granite like the Valle Nevado slabs shown here is a timeless classic. In this cooking space by Maryland based, Case Design, the subtle natural pattern of the countertop is an ideal backdrop for the classic subway tile backsplash. The natural stone's gray flecks also pick up the color of the stainless steel appliances. Ubatuba granite countertops as shown have a speckled appearance with a little bit of shimmer. When renovating this cottage kitchen, California based Gatling Design choice the particular slab for its textured appearance. Think granite looks dated? The countertops in this traditional, yet modern kitchen prove otherwise. Called Delicatus white granite, the slabs pictured here have a clean white background with contrasting dark veins. The cooking space designed by Maryland based Davida's Kitchen & Tiles including a matching granite dining table. Warm up a white kitchen with Antico cream granite countertops as shown in this cooking space by Maryland based Davida's Kitchen & Tiles. The countertops gold and brown flecks pick up the colors of the travertine subway tile backsplash. This spectacular kitchen by Canadian firm Jodi Foster Design & Planning reflects the natural beauty of the home's spectacular views. Wood cabinetry and a green glass backsplash are both combined with Titanium granite countertops. The natural stone material is filled with lovely shades of black, gold, and ivory. White Supreme granite is one of our favorites. The natural stone is known for its soft gray and soothing white veins and swirls. In this kitchen by San Francisco based firm, Gast Architects the material tops off the counters and backsplash. Chocolate brown cabinetry is partnered with Venice Cream granite countertops in this kitchen by Spokane Stone Creations out of Washington. The stone's warm creamy background features brown and black flecks and veins. Marble and granite are a winning combination in this kitchen by Triton Stone Group based in Harahan, Louisiana. The countertops are Colonial White granite. The backsplash is a marble pencil mosaic. The interior design firm, New England Design Elements out Londonderry, New Hampshire transformed a dilapidated farmhouse into a livable home. Refreshing the kitchen with a modern farmhouse vibe was a top priority. The countertops are Azurite granite. The polished slabs feature shades of black, blue, gold, and cream. The cabinets are a paint shade called Heritage Red by Benjamin Moore. This chic kitchen by Case Design out of Bethesda, Maryland has two different countertops. The kitchen island is topped off with quartz. The countertop lining the wall is gray granite with swirling white veins. Blue Dunes granite countertops punch up this kitchen by Washington based stone installed, Spokane Stone Creations. The slab features black, brown, and gray veins and swirls. We love how the natural stone's colors beautiful work with the hammered copper sink and oak kitchen cabinets.